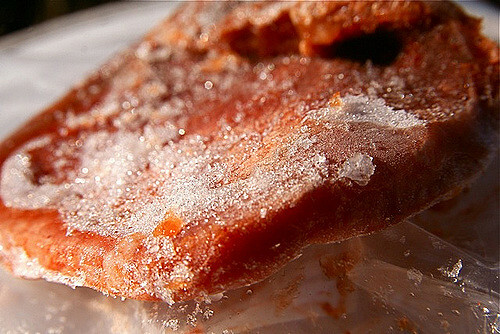 Pulling a nice steak out of the freezer only to find it covered in dry, discoloured leathery spots is never a nice moment, but what is actually happening when food falls victim to the dreaded condition that is freezer burn, how can you prevent it and, most importantly, does it pose a risk to your health? So, firstly, what is freezer burn? Somewhat bizarrely, freezer burn actually has nothing to do with an actual burn. Rather, it is caused by dehydration and oxidisation, primarily as a result of sublimation (whereby a substance transitions directly from solid to gas without becoming liquid). Basically, providing that the air is cold and dry enough, water will evaporate at pretty much any temperature; even from the surface of ice. It does this via sublimation, meaning that no liquid water factors in; it all goes straight from ice to vapour, causing the affected product to lose substantial levels of moisture in a relatively short time. The newly water-deprived food will become extremely dry and shrivelled. Oxidisation of the area soon follows, further exacerbating the issue. The term ‘freezer burn’ is used in reference to the appearance of the affected area, rather than the process by which it became so. How can you prevent freezer burn? Preventing freezer burn all boils down to minimising the food’s exposure to air. The easiest way to do so is by ensuring all frozen goods are stored in sealable, airtight containers. Large items like joints of meat or loaves of bread should be wrapped, double-layered where possible, in plastic wrap, wax paper or aluminium foil before being placed into a container or freezer bag. Of course this won’t stop freezer burn indefinitely; anything stored in a freezer for an overly-prolonged period of time will eventually fall victim to freezer burn, so make sure you rotate the contents of your freezer, ensuring older food is consumed before this can become an issue. Does freezer burn pose any risk to your health? In simple terms, no. While freezer burn will affect the appearance, texture and flavour of a product, it is in fact perfectly safe to eat. The effects of the condition can be rather unpleasant, but not dangerous; simply cutting off the affected area, providing it isn’t too large for this to be a viable option, will prove sufficient in returning the item to its original quality.